When a bigger vehicle hits a smaller vehicle, the smaller one usually takes most of the damage. This is how it played out when a Milk Tanker hit a Force Cruiser head-on, near Bhatinda, Punjab. The momentum of the tanker was so much that it went on to collide into a Tata Safari, overturning it. A party of 14 people were heading to Hari Nau Singh village, near Jaitu, Faridkot district, Punjab, to attend a funeral. They were in a Force Cruiser MUV, configured to carry 12 people. When they reached Dashmesh school, near Talwindi Sabo, a Milk Tanker coming from the opposite direction hit the Cruiser head on. 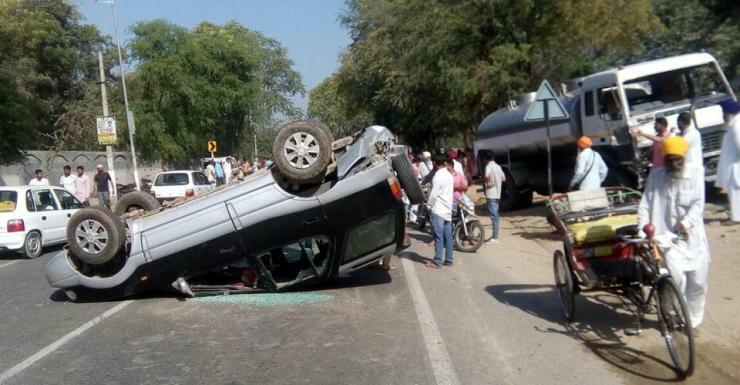 The crash left Lachhami Kaur, 40; Prasin Kaur, 60; Tek Singh, 45; and driver Budh Singh, 55, all traveling in the Cruiser, and residents of Rama Mandi, dead. The 10 others traveling in the Cruiser were injured, 5 of them grievously. 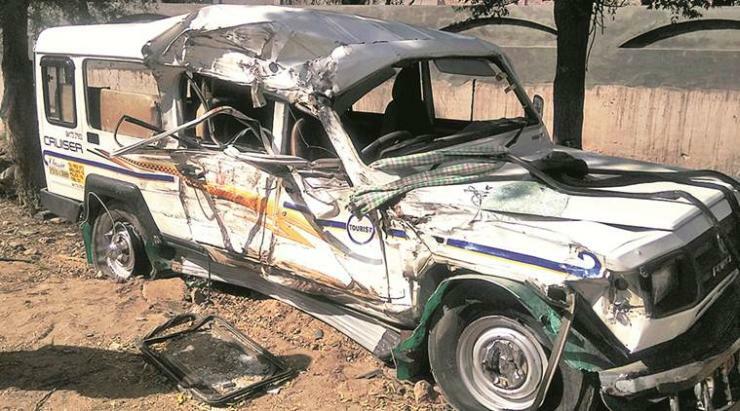 The force of impact was such that the tanker went on to hit a Tata Safari, overturning it. However, the passengers of the Safari, who were rescued by onlookers, escaped unhurt. The tanker driver, Shingara Singh, fled from the spot, but police nabbed him a while later. He’s been charged under Section 304-A of the Indian Penal Code (IPC) for causing death due to negligent driving. Most highways in India are yet to have clear dividers or grade separators. Such roads are more dangerous to drive on than roads that have grade separators. Here are a few measures you, as a driver, can take to minimize the chances of an accident on such roads. Stick to the speed limit. When it doubt, don’t drive faster than 80 Kph. A slower speed means more time to react, and in the worst case – lower impact. Overtake very cautiously. Undivided roads are generally narrow, making overtaking even more riskier. Most accidents on these roads happen during overtaking. Therefore, exercising abundant caution while overtaking on such roads is a must. Avoid night-driving on such roads. At night, many vehicles in India use high beams, making driving both risky and uncomfortable.